Vacuum Assisted Self Priming Pumps - PP Series - Solids Handling From Pioneer Pump Ltd - World class manufacturer of high performing end-suction and self priming pumps for construction, mining, municipal and process related industries. Vacuum assisted self priming pumps providing an Environmentally Safe Priming System, Extreme Manoeuvrability and Superior suction lift capabilities. Priming is very fast: a 1.4m3/min air pump is used. 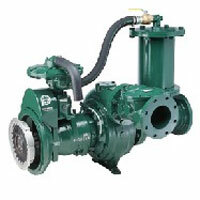 Extremely manoeuvrable pumps can be positioned to suit application. Seal designed for indefinite run-dry capability. Choice of water cooled or air cooled diesel engines. Available in Silent Pack Configuration to 65dBa.